I’ve been working with my daughters to learn the Koyukon Athabascan. I started out by creating Vine videos to record words and sharing them on Twitter (@ayatlin). I recently migrated to Instagram because of flexibility and editing function. I’ve also uploaded the videos to Facebook. My friend, Mary Deming Barber, recently wrote about how I’ve been using Vine to teach Athabascan on her blog. I know a lot of words in Koyukon Athabascan, but I do not speak it or know how to spell it. I have been learning as I go. My aunt Irene Henry of Allakaket recently sent me some worksheets with Koyukon words for us to use. 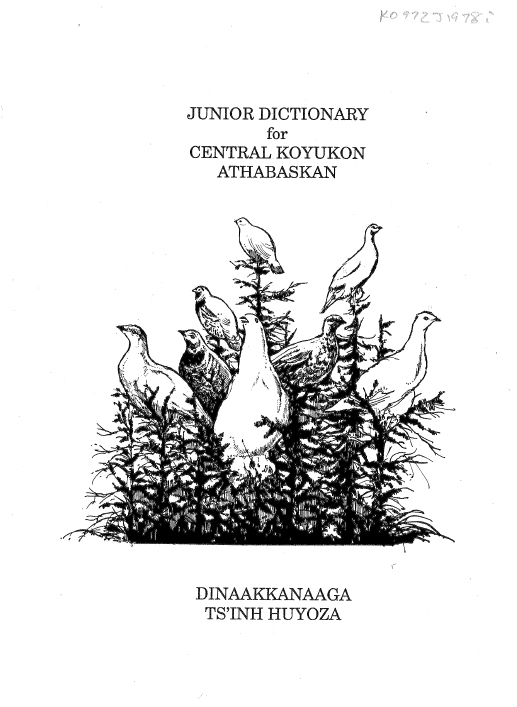 I have also downloaded the Koyukon Junior Dictionary written by Athabascan linguist, Eliza Jones of Koyukuk, Alaska. Nee’eeneegn’ Upper Tanana Athabascan July 15-20 at Northway’s culture camp which is upriver from the village during an overnight camp setting. Denaakk’e Koyukon Athabascan August 4-9 in Anchorage at the Alaska Native Heritage Center. Dene Languages. Map courtesy of the ANHC. I am planning to attend the one in Anchorage. The registration costs, meals and learning materials are free due to sponsorship from Doyon, Limited, which launched an Athabascan Language Revitalization initiative in 2012 to promote the Native languages within the Doyon region. Travel and lodging are not provided. Ruth Johnny of Northway and Beaver Creek and Cheryl Silas of Northway and Fairbanks will be the instructors for Upper Tanana week in Northway. K’etsoo Susan Paskvan of Koyukuk and Fairbanks and NedosdeghaaLno Esther McCarty of Hughes and Ruby will instruct the Koyukon Athabascan language week in Anchorage. Esther McCarty teaches the Koyukon Athabascan language and songs. For years, people in the Yukon/Koyukuk area ask her to make Koyukon Athabascan songs for memorial potlatches. I recorded Esther in 2008 when she did a blessing for a special event in Ruby, Alaska. Susan Paskvan writes the Athabascan Word of the Week column for the Fairbanks Daily News-Miner. The words for June 22, 2013 were sołtaanh nezoonh (a good woman) and hunek zoo’ (a good story) in dedication the Mary Beth Smetzer who retired from the Fairbanks Daily Newsminer. I love how Susan blends stories and background information into teaching the languages. Susan is the daughter of Eliza Jones. Susan Paskvan shared the following information about Menhti Kenaga’, the language of Minto and Nenana. Students at the Nenana Summer Fish Camp are learning Menhti Kenaga’ through immersion methods, taught by Susie Charlie, Vernell Titus, and Susan Paskvan. Here are some of the phrases they are learning. Setsoo Jennie Irwin be’oozra’. My grandmother is Jennie Irwin. Setseya Jack Irwin dideyoh. My grandfather was Jack Irwin. En’a _____ be’oozra’. My mom’s name is ____. Ta’a _____ be’oozra’. My dad’s name is ____. __________ se’oozra’. My name is ______. After the 1.5 hour session students, were allowed to ask questions and make comments in English. They asked, “who spoke this language?” and commented “my grandma said she was punished for speaking our language”. Setsoo Susie Charlie told them that this was the language of our people. Through language they are learning about their grandparents and that is important for them to know. I am grateful to have this opportunity to learn and am excited to be able to do so with my children. I’m pretty sure I’m making mistakes as I’m saying the words. I hope to learn how to correctly pronounce the words and phrases during the language week. I would love to be able to understand Elders who speak in Koyukon Athabascan, and perhaps hold a conversation with them. Language is important to pass on the culture and traditions.